As we approach the 30th Abbey Medieval Festival and the start of my fifth decade as a re-enactor I think these are appropriate milestones for me reflect on what has passed. I am the first to admit that even though I have now performed at 28 Abbey Festivals I am still having difficulty in grasping that the event is turning 30; my how times flies when other people are having fun trying to stab, and bludgeon with a variety of pointy metal objects. 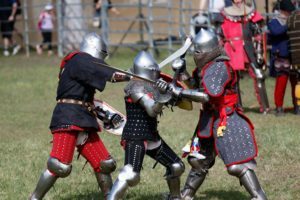 The growth of the festival and the growth of living history or re-enactment in Queensland are intrinsically linked, as I believe it is no accident that there are more re-enactors in Queensland than there are in the rest of Australia. Strange as it may seem even many of the ancient and modern era re-enactment groups have many of the medieval re-enactors who regularly perform at the festival among their core members. After all after you have spent a small fortune and years of research on getting your medieval impression happening properly, starting again from scratch for a completely different era makes perfect sense; at least to some of us! This does beg the question what is the attraction in re-enactment that makes the time, money and effort worthwhile? Speaking from personal experience it is quite simply more emotionally and intellectually rewarding in ways not many activities can be. It has introduced me to people of such prodigious talents and intellect that I feel awed to call them my friends. Over the last .4 of a century as a re-enactor I have been assaulted with swords, axes and spears by friends (and total strangers), danced, laughed myself sick, fired cannons, commanded tanks and shield walls, made stone tools, forged iron, smelted bronze, been an archery target, given presentations at museums, made ancient cosmetics, eaten amazing foods, drunk way too much, made my own shoes and clothing, heard medieval Latin mass, invocations to Mithras, amazing stories and astounding music, participated in tournaments, jousts and puppet shows, built furniture, created artworks, smelt perfumes worn by ancient Pharaohs, Emperors and Shahs, made and fought in armour, researched and recreated 600 year old rituals and had my mind opened to an array of cultures, cuisines, beliefs and experiences I could not have imagined when I started. For me it has also opened a career in museums, education, publishing, theatre and film that were certainly not on my radar when I left school and started work in the Justice department! As a result of this awakened passion for the past it I have hiked through primeval forest in search of wild Bison, stood on the snow covered walls of Novgorod, watched desert sunset from the roofs of Xiva, dawn over Hagia Sophia and moonrise over the gilded domes of the Moscow Kremlin, uncovered human remains in Malbork, visited Roman temples and oh so many castles, dined in yurts on peaches from Samarkand, explored millennia old citadels on the Silk Road and stared in wonder at the art and artefacts in a hundred museums and sites in Europe and Asia. In short re-enacting been a mind altering and life changing experience that, God willing, will continue for a long time to come because being a history nerd can really be quite exciting at times. Guest Blog by Damien Fegan. To see more of his life as a re-enactor, and to keep up to date with his work, check out his Facebook Page: Museum History Guy. If you would like to see Damien’s re-enactment group Historia please look for them at the Abbey Medieval Festival 30th Anniversary Celebration on July 13th and 14th. 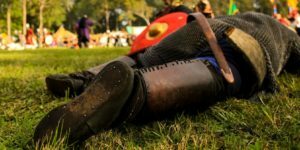 Swords – an introduction to sharp pointy things! No item in medieval history excites as much curiosity and misinformation as the Sword. Light, well balanced and deadly, a medieval sword was not the slightly sharp crowbar of popular myth. A typical single-handed sword weighed generally between 700 g and 1.5 kg at the most. As a comparison a 1 litre carton of milk weighs 1kg: if you are strong enough to put milk on your breakfast cereal unaided, you could easily lift a sword. Most swords had a tapering double- edged blade, a crosspiece to protect the hand, a grip and a pommel below the grip to act as a counterweight. make the blood to run out when you stab someone. Neatest correct entry does not necessarily win in battle! allow air into the wound. Exposure to air is rarely fatal. The sword was the most versatile, expensive and prestigious of weapons of the middle ages. It could be used to attack with cut, slash or thrust and could also to defend, though swords were designed to be used with a shield until the introduction of two handed swords in the 1300’s. This coincides with the development of plate armour, as it is a good idea to have a bit of extra protection if you are can’t stop incoming nasty things with your shield! The medieval two handed sword generally weighed under 2.5 kg; often much less. Whilst the giant 10kg sword of popular myth would make an impact on an opponent, actually hitting them with it, without popping your shoulder, elbow and wrist joints might prove difficult. It is not so much a matter of having a sword light enough to swing for hours on end rather than being able get your sword where you need it in the split second that it needs to be there! The weapons used by the re-enactors at the Abbey Medieval Festival generally only differ from the originals in the sharpness of their edge. Swords were rarely razor sharp, not because they could not achieve a razor edge (after all what did they shave with?) but because a thin razor edge would blunt immediately on contact with a hard surface such as armour or another sword. A sharp chisel edge was preferred for most swords; if you have ever plunged your hand into a box of old tools and come into contact with the business end of a wood-working chisel, you can appreciate how devastating a chisel edged sword could be. It became customary to use blunted or “plaisance” (pleasant) weapons in tournaments; though believe me, the experience can only be considered pleasant when compared with being hit by a sharp sword. During the Renaissance it became customary to “foil” or blunt and cover the tip of a rapier when practising your swordsmanship, which is a sensible precaution if you want to keep your friends. Don’t forget, if you are planning on bringing along your favourite (steel, wooden, foam, cardboard, big, small, indifferent) sword to the festival this year, as well as your ticket, you will need a weapons permit so that we can keep everyone safe. Click here to apply.